Prof. Michael Adikwu, the Collation Officer of the election in Kogi State, said that Buhari, who is the presidential candidate of the All Progressives Congress scored 285, 894 votes ahead of the candidate of the Peoples Democratic Party, Alhaji Atiku Abubakar, who polled 218,207 votes. Adikwu, of the University of Abuja, said that Buhari won in 14 out of the 21 local government areas in the state while Atiku won in seven. According to him, Buhari led Atiku with a of 67,687 votes. The Independent National Electoral Commission on Monday, declared the All Progressives Congress candidate, Tolu Odebiyi, as the winner of the Ogun West senatorial election. The Returning Officer, Prof Taofik Shittu, who announced the results at the collation centre in the Ilaro area of Yewa South Local Government, said Odebiyi, polled a total votes of 56,452 to defeat the APM’s Olusegun Gbeleyi, who polled 48,611. The candidate of the Peoples Democratic Party, Leye Odunjo, scored 43,454. In the Egbado South LGA: the APC polled 10,375 votes, while the PDP took second place when it polled 8,533. The APM polled 7,814 to be the third and the ADC polled 2,940. In the Imeko-Afon LGA, the ADC got the highest votes with 9,348. While the APM polled 4206 to be the second, the APC became third polling 3,750. The PDP scored 3,238. At Ado-Odo/Ota LGA, the APC polled its highest score with 24,693. As the PDP scored 15,638, the APM followed closely scoring 14,012. The ADC polled 7,235. In the Ipokia LGA, the APM polled the highest votes with 15,128, while the PDP scored 9,954 votes. The APC polled 9,929 and the ADC polled 2128. Lastly, in the Egbado North LGA, the ADC scored the highest with 9761 votes, the APC followed closely with 7705, the APM polled 7451, while the PDP polled 6091 votes. 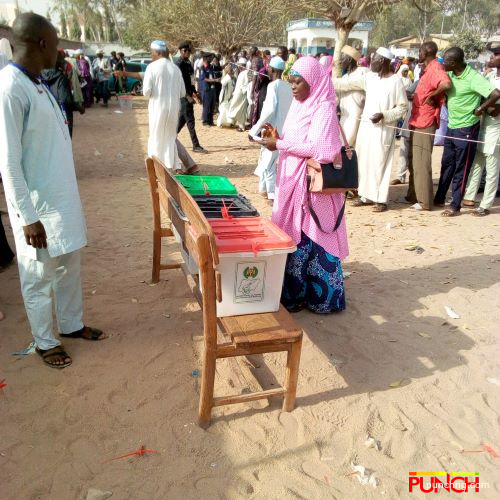 The elections for Kogi East Senatorial District and Dekina/Bassa Federal Constituency have been declared inconclusive due to widespread violence, Independent National Electoral Commission said on Monday. 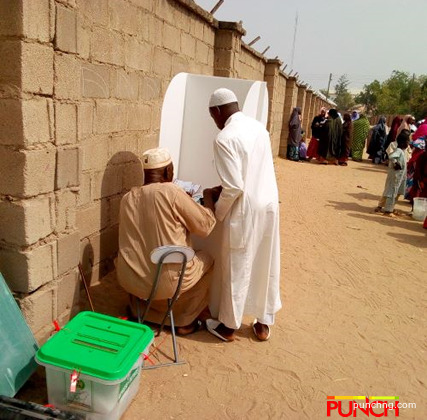 President Muhammad Buhari is leading in twelve of the 21 Local Government Areas of Kebbi State in the presidential election results so far released by INEC Collation Officers. In the results received by the Collation Officer, Prof. Haruna Bichi, the Vice-Chancellor, Federal University, Dutsinma, Katsina state, APC scored 42,970 in Jega Local Government Area against Peoples Democratic Party which polled 7,416. Similarly, in Koko/Besse local government, APC scored 25,874 as against PDP which got 5,668, while in Maiyama Local Government, APC scored 30,001 as against PDP which scored 6,279. The collation officer also said that in Argungu Local Government, APC won with 42,038 while PDP scored 6,951. The News Agency of Nigeria had earlier reported that APC scored 17,863 in Aliero Local Government against the PDP which polled 5,458. 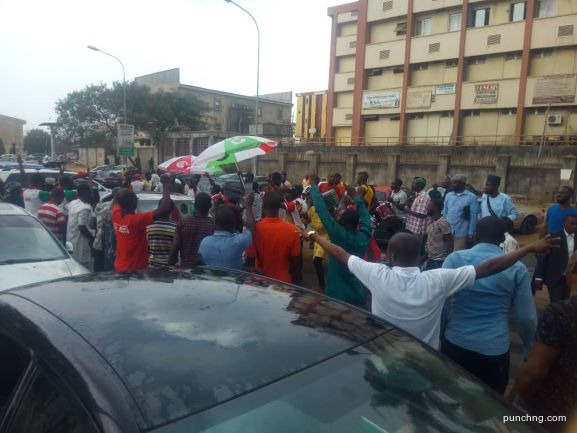 PDP supporters celebrate what they call “the impending victory” of Senator Phillip Aduda at the INEC FCT Senatorial election collation Centre on Monday. The Police have arrested five male suspects in Umuahia, Abia State, in connection with the attack on a Deputy Superintendent of Police who was on election duty at a collation centre. The suspects also attacked a Deputy Commissioner of Police in Brass, Bayelsa State on Sunday. The Acting Inspector-General of Police, Mohammed Adamu, has ordered the arrest, investigation and diligent prosecution of the suspects. The election results of Ogun East Senatorial District was on Monday declared inconclusive by the Independent National Electoral Commission. The Returning Officer for Ogun East, Prof. Chris Onwuka of the Federal University of Agriculture, Abeokuta, said that the decision to declare the election inconclusive was based on the principle of INEC. He said the election was cancelled because of over voting in Ajebandele Ward in Ijebu East Local Government where total vote cast were more than the number of accredited voters. There was protest within the collation centre at Ijebu-Ode Local Government Town Hall when Onwuka was about declaring Senator Lekan Mustapha of All Progressive Party as the winner of the election. Mustapha polled a total vote of 84,929, his closest rival, Mr Adeola Sosanwo of the Peoples Democratic Party, polled 82,457 votes. The returning officer said that there was alleged case of discrepancies in the election results. Onwuka said, “And if the election is being conducted, it can sway the decision in any direction. Based on the principle of INEC, the election is going to be declared inconclusive. “I have given you the logic because the officer said he cancelled some polling units, but 13,000 is reflected here. Mr Nicholas Tofowomo has rejected the decision of the Independent National Electoral Commission declaring election in Ondo South Senatorial District inconclusive. Tofowomo is the senatorial candidate of the Peoples Democratic Party in Ondo South Senatorial District in the last Saturday Presidential and National Assembly elections. The News Agency of Nigeria reports that Tofowomo polled 79,029 votes against his closest rival. Sen. Yele Omogunwa of the All Progressives Congress who scored 51,993. Prof. Kayode Onifade, the INEC Returning Officer for Ondo South declared the election inconclusive over what he described as various irregularities in the election. He also cited the cancelled votes of 28,047, which was higher than the leading margin of 27,036 votes as another reason for the decision to declare the election inconclusive. The People’s Democratic Party presidential candidate Atiku Abubakar, has defeated President Muhammadu Buhari, of the All Progressives Congress APC in the Saturday’s presidential election conducted by the Independent National Electoral Commission in Enugu state. Atiku polled a total of 355,553 to defeat Buhari who polled a total of 54,423 votes, while the candidate of the Young Progressive Party, YPP, Professor Kinsley Moghalu polled a total of 1,371 to come a distant third. Announcing the result as garnered by each political party, was INEC returning officer for Enugu State, Professor Joseph E. Ahaneku, Vice Chancellor of Nnamdi Azikiwe University, Awka. Hajiya Aisha Dahiru of the All Progressives Congress has won Adamawa Central Senatorial seat, making her the only female Senator-elect so far in Northern Nigeria. The Returning Officer, Prof. Buba Jakusko, said Dahiru scored 188,526 votes to beat Mr. Murtala Chibado of the Peoples Democratic Party, who scored 96,530 votes. Jakusko said Mr. Mustafa Madawaki of the African Democratic Congress came third with 36,030 votes. The Adamawa Central Senatorial zone is made up of Yola South, Yola North as well as Girei, Fufore, Song and Gombi Local Government Areas of the state.